The College Board made its new app public—just in time for the PSAT! The coolest feature by far is something called Scan-and-Score. 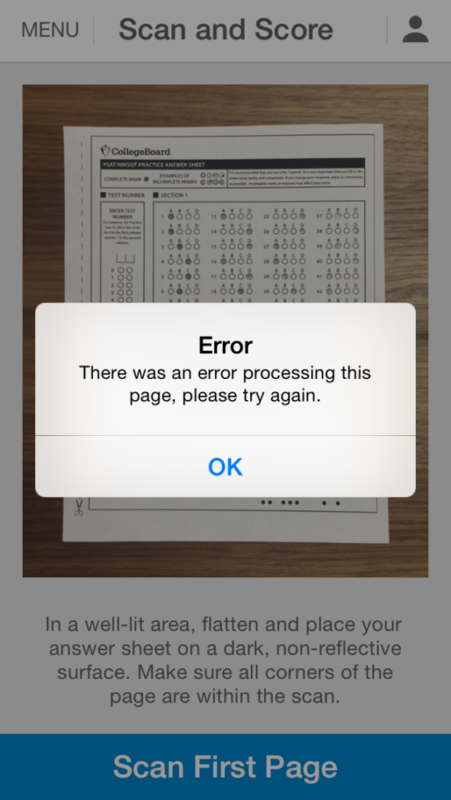 Here’s how it works: from the app, you take a photo of your SAT/PSAT answer sheet. The answers are uploaded, checked, and a score report is generated. Boom! You’re done. Hopefully this gets resolved quickly. This is a really cool feature that empowers students and makes grading tests a snap, literally. Hard to give it a review until it’s working, though. SAT & PSAT app, Scan and Score. permalink. This is an old post, but for those of you having the same issue, the mistake here might be that you didn’t mark the test number.